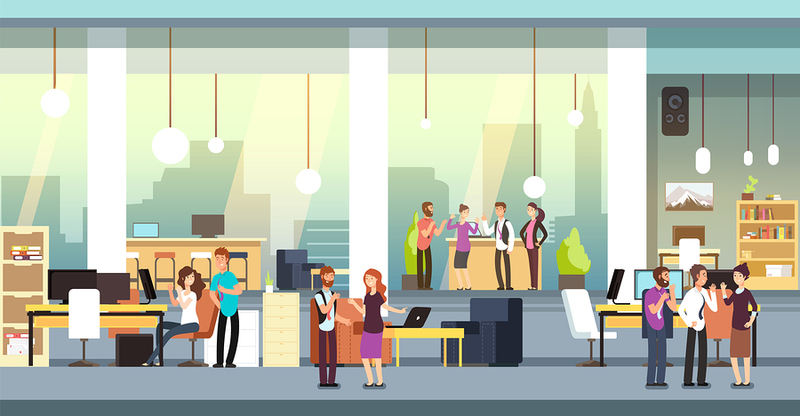 According to a new study published in the British medical journal Occupational and Environmental Medicine, workspaces without partitions are beneficial to our health. Conducted among 230 employees working in federal offices, the research showed that open area offices promote physical activity, reduce stress and therefore help you to be in more mentally and physically fit. Inviting workers to wear sensors for three days, Dr. Casey Lindberg, a researcher at the University of Arizona, was able to analyze their heart rate, movements and stress level. Their perception of pressure was also assessed each hour using a questionnaire that employees were asked to answer through a mobile app. According to the results, employees in an open office were 32% more physically active than employees with a private set up, and 20% more active than workers sitting in a cubicle. “The open nature of an office may lead to increased physical activity by encouraging interactivity and mobility, including moving to a space designed for unplanned meetings and phone calls,” the study Effects of office workstation type on physical activity and stress says. In addition, physically active employees were 14% less stressed after office hours than those who moved less at work. “This research highlights how office design, steered by the type of office workstation, could be a factor for promoting health,” the researchers add. Their findings are accompanied by a study from the Robert Half firm, conducted among 500 Canadian professionals. According to a survey published in April 2017, 81% of workers feel that open arrangements favour collaboration. And when combined with intimate spaces, they believe they contribute to creating a more productive and less stressful office environment.